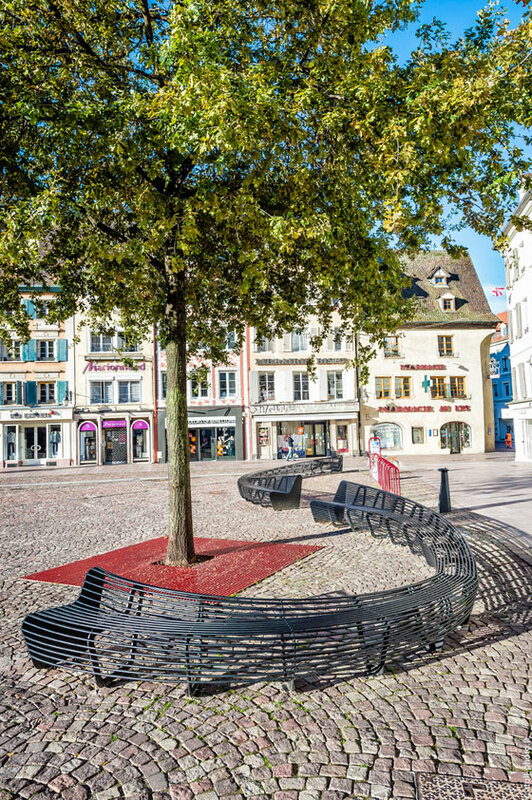 In the space of a decade, the Circular Bench from Belgian designer Lucile Soufflet has attracted a growing number of European cities. Playing on the transformation of its profiles, this circular bench flexibly stretches and extends to create different seats and different perspectives of the surrounding environment. The backrests rise and fall, sometimes facing each other, sometimes all alone. 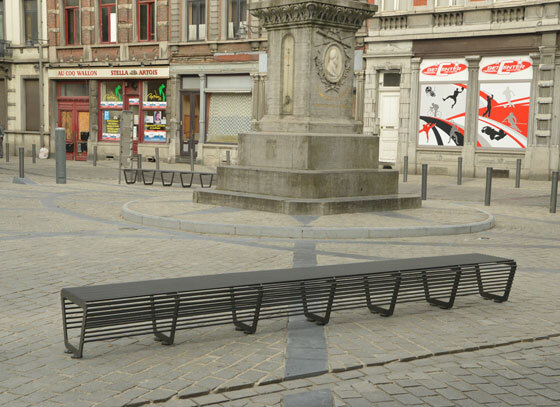 The first Circular Bench was installed in Brussels in 2003 in the Marché aux Grains square. A tree had been placed in the centre of the square at the request of the inhabitants. 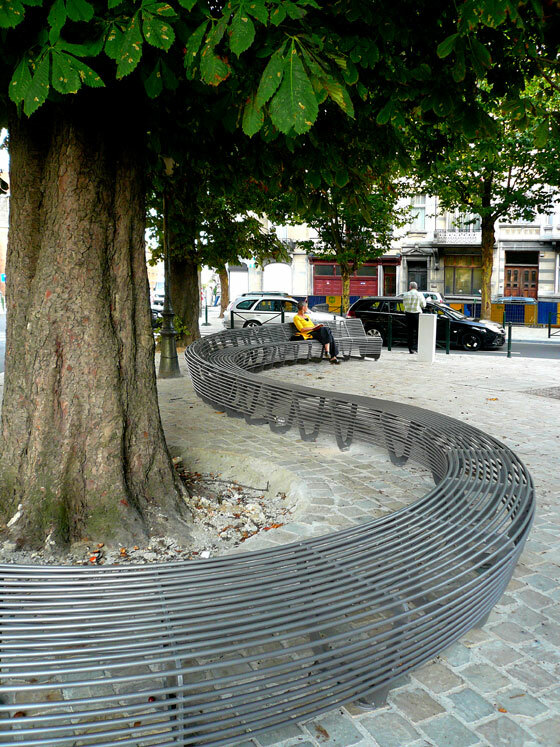 The City of Brussels wanted an artistic fence work to protect the tree. Lucile Soufflet proposed enlarging on the theme, and only keeping the one of the seat around the tree. Ultimately, the bench extends in a circle, stretching and returning around the tree. The idea was to play on the principle of construction and to create a shape that transforms in a circular way in the space. At the two extremities, the profiles lose their shape, and the backrests appear, creating two facing seats. The theme of relationships in the public space is at the heart of the installation of this furniture that invites dialogue. It is an element both playful and convivial, two indispensable ideas for our community life. For the municipalities, integrating furniture like this in their environment challenges the passer-by, the local resident, the visitor. It invites them to sit, and take some time. It adds to quality of life and wellness. Today, this furniture has attracted other cities and towns in Belgium and France, including Saint Pol sur Mer, Brussels, Krinkels, Schaerbeek, Mons -2015 European Capital of Culture - and Mulhouse, as well as Sierre in Switzerland. The range has been enriched with new variants: the Solo Bench and Line Bench models, and many made-to-order benches have extended the catalogue. Lise Coirier, artistic advisor for the TF Urban brand, met with Lucile Soufflet to discuss this best-seller that she continues to reinvent in response to worksites and to landscaping and urban management. L.C. : What is your approach to urban design? L.S. : Ideally, and when possible, I design a project for a specific place. I work in a very intuitive way, but I need to stay connected to reality. The evolution of urban design is generating collaborations that were quite rare several years ago; it’s very enriching. L.C. : How do you see your role as a designer in the design and installation of urban furniture? L.S. : I control the design of a project by paying attention to the site, to the sponsor, to the user, to the specifier… I see the designer as an equilibrist who searches for the right position in relation to the surrounding world. L.C. : Can you briefly describe your experience with the Circular Bench as a modular, customisable product created and produced by TF? L.S. 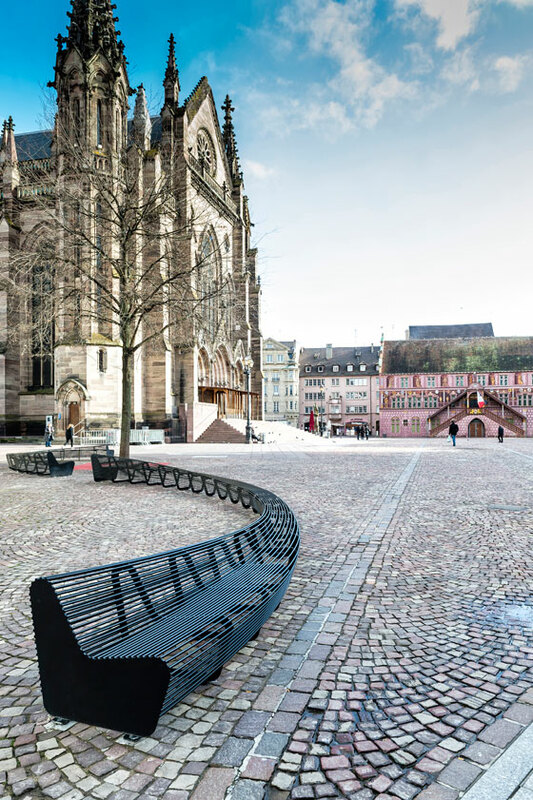 : The bench was initially designed for a square in Brussels. It quickly became apparent that the principle behind it was infinitely modular: it stretches, extends, changes its seats and its perspectives … which makes it possible to adapt it to many sites, and to make each site unique. L.C. : How does the collaboration with TF and its specifier clients work? L.S. : We have several ways of working according to the project, but generally we work with proposals, counter proposals, a formal validation by me and a technical validation by TF. The dialogue is direct and open, which allows a great reactiveness vis-a-vis the client. L.C. 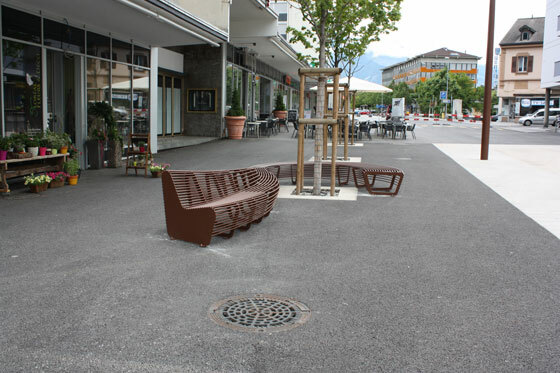 : Was the Line Bench the result of a requirement in the specifications of the cities and towns? L.S. : The backless Line Bench came from a request by an architectural firm for an urban redevelopment. 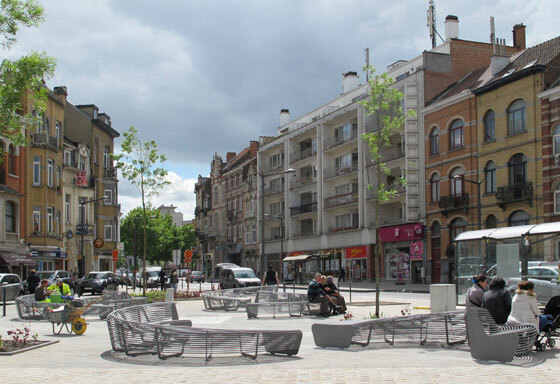 At the same time, I designed a Line Bench with a backrest for Anderlecht, and indeed, towns such as Langres contacted us in order to specify “line” variations in their own redevelopments. Basically, there are numerous and varied cases. L.C. : What characterises the Circular Bench? What are its strengths? Its originality compared to classic urban furniture catalogues? Its durability? Its conviviality? L.S. : First of all it is a durable object. The first model was installed in 2003 and hasn’t moved. Its originality gives it a strong presence, but its visual lightness makes it easy to integrate into the urban landscape. It is an element that seems both weightless and solid. Finally, it symbolises in a fun way how we relate to others, conviviality. L.C. : What innovation does it bring? L.S. : The model has shown its great adaptability at the various sites where it has been installed. The large elements are obviously more interesting and allow the forms to spread out, but they require a sufficiently large space. I leave it to you to imagine the ideal cities within which it could find the space! L.C. 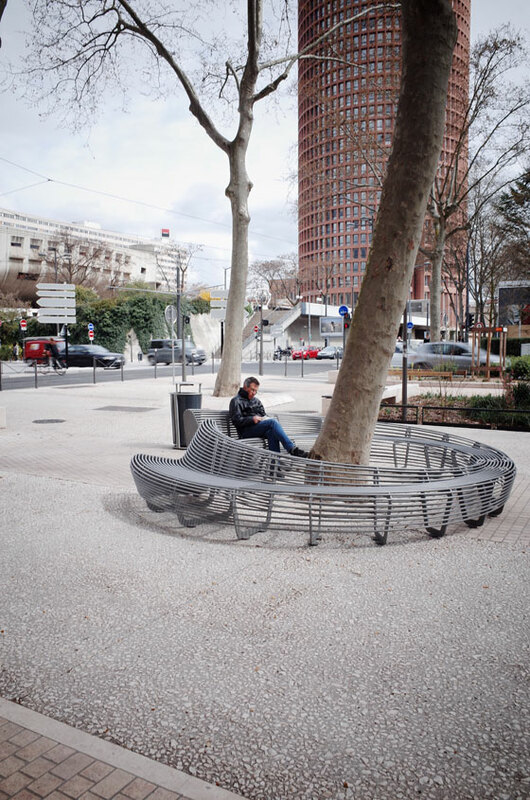 : The Circular Bench is an object that is very present but that integrates perfectly into the urban landscape. Does this facilitate its adoption? Does it push communication? What personality does it give to the urban space? Has the relationship with colour changed and are the cities bold enough to use strong tones? L.S. : The Circular Bench is based on a reflection on the relation with the other, on communication, on relationships. Without being imposed, this idea is smoothly affirmed by the curves of the bench. In the same way, it is an object of contrasts, both powerful and light, original but integrated, graphic while translucent. Cities are indeed daring to add colour. 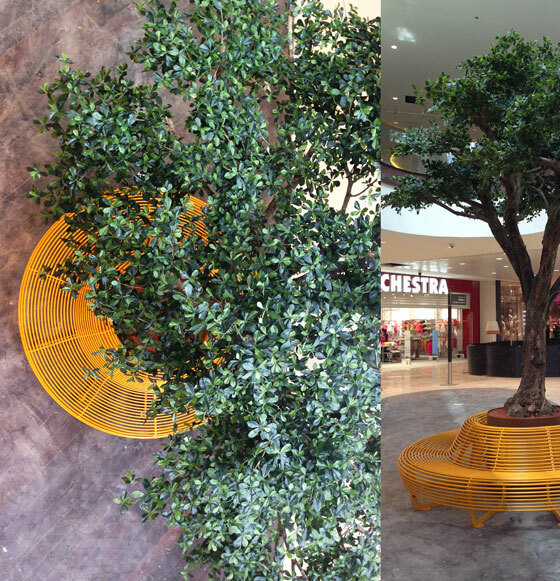 Marseille is a good example; it installed the Circular Bench in bright yellow! I think that it’s a good step; that being said, this furniture is so graphical that I have a weakness for the colour anthracite, which contrasts with and highlights the play of its lines. L.C. : Can it be adapted to other places and uses? Will it be plug-and-play furniture in the future? L.S. : Absolutely! I think that there is still a lot to be said and done around this project. 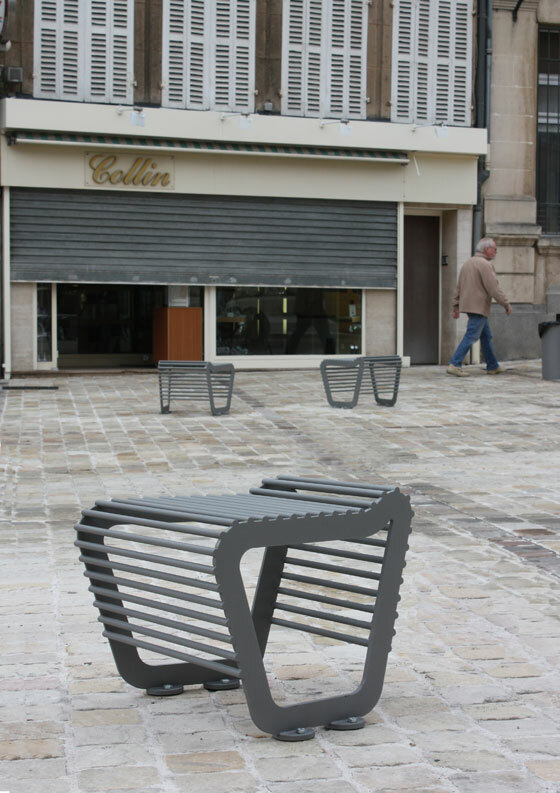 A graduate in Industrial Design from the La Cambre School of Visual Arts in Brussels (BE), over time Lucile Soufflet has specialised in the design of urban furniture and the reflection on the public space. After a period as an assistant at the Royal College of Arts in London, she worked in fields such as ceramics and textiles. She has won several awards, and her creations are represented in the collections of multiple museums and produced by companies such as Fermob, Urbastyle, Royal Boch and TF. She has also responded to many offer to tender in the urban space where she has realised, amongst others, signage and furniture for My Place­Inside at the Brigittines in Brussels (arch. 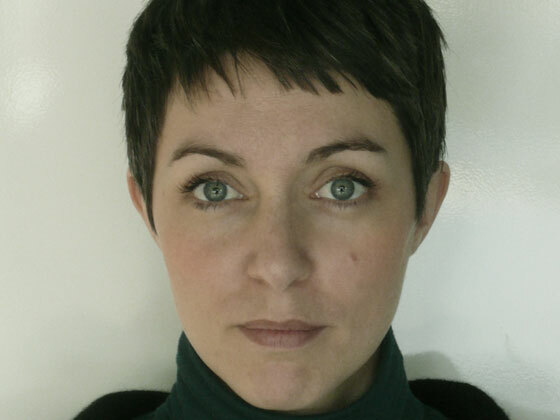 Andrea Bruno), My Place-Outside in Anderlecht, Molenbeek, and furniture for the cities of Touquet and Brussels (Jacques Brel square). 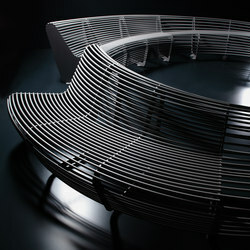 The standard model of the Circular Bench is comprised of 500 meters of steel wire cable and 1000 weld seams, and represents 110 hours of work at TF.